In my previous review on Menan Chitose, I mentioned that I was weary of reviewing ramen restaurants in Shinjuku because of the perception that the quality of ramen diminishes as a shop gains popularity. Sadly, due to rising rent prices or for a capitalization of a sudden popularity increase, many shops located in the Shinjuku area will try to maximize their profits as much as they can, sometimes at the expense of quality and service. Today, unfortunately, I have to write my first, disappointing review of a ramen shop. I visited the famous Fuunji for the first time in about 8 years and came away extremely disappointed and sad that a great ramen shop fell to the pressures of profit margins. Now, to be as transparent as possible, I will admit that I typically review ramen restaurants listed in tabelog.com’s top 100 ramen shops and/or my favorite local shops around Tokyo, so there is some bias in that I may be unfairly comparing Fuunji to the top ramen restaurants in the country as well as my own personal favorites. However, as a tabelog.com’s top 100 ramen shop itself, I feel that Fuunji should be held to the same standards that I used for my previous reviews. Now if you’re not aware, Fuunji has been a ramen enthusiasts’ favorite and immensely popular ramen shop since its inception back in 2007. Fuunji is the predecessor to many of the chicken and niboshi broth tsukemen restaurants you see today such as Menya Itto and Niboshi Tsukemen Miyamoto, both of which are top ramen shops in Tokyo. However, both have easily surpassed Fuunji in many rankings, including Tabelog and Ramendb, and after dining here I can see why. Three things stood out to me when I had my tsukemen at Fuunji that highlighted a stark difference from when I came 8 years ago. Before I get in to it, I’ll review the restaurant exactly as I have in my previous articles and talk about my disappointment along the way. Once you walk in to Fuunji, you’ll be greeted with the ticket machine directly to the right. Fuunji has two different ramen types, the regular and tsukemen with both coming in Tokusei, or extra topping, versions. In addition you can add on extra noodles and toppings such as extra soft boiled egg, dried seaweed, menma bamboo shoots, green onions, and/or char siu for an additional cost. Beer, oolong tea, and coke are also available for purchase. Lastly, a souvenir tsukemen set can be purchased so you can make three tsukemen at home or for your friends if you’d like. I opted for the Tokusei Tsukemen for 1000 yen on this visit and took my place in line. My first gripe with Fuunji was the wait. Long time followers of my reviews know that I have no problems with waiting in long queues in freezing cold temperatures, but at Fuunji they cram you in to the back of the shop standing directly behind eating patrons. In my opinion this is problematic for both those in queue and the dining patrons. It’s hard to have an enjoyable dining experience when there is a waiting customer standing directly behind you while you eat. Standing in line is also uncomfortable as you’re constantly trying to stand as close to the wall as possible so you don’t interfere with the people eating in front of you. When I arrived, the restaurant had already filled their seats and I was third in line behind two friends waiting to sit together. When a seat opened an employee asked if they would like to be seated together, to which they replied yes. So instead of waiting for the seat next to the vacant one to open, they decided to fill it with the next customer in line dining by themselves. Of course, this worked out for me, but I thought it was strange and incredibly inconvenient for those waiting in groups, making them wait until side by side seats opened side by side for them to get seated. The customer waiting behind me was also by himself and he was seated next when the seat next to me opened. If the waiter had just waited another 3 minutes, they could have easily seated the two waiting together, but was forced to seat two guys waiting behind them because two seats weren’t open at the same time. While waiting in line, the waitress took my ticket and asked what size noodles I’d like. As I was hoping to try another ramen shop after this visit, I opted for the Nami as opposed to the Oomori (more noodles). Since they had my ticket, my tsukemen arrived almost immediately after I was seated. My second grip with Fuunji came here. While I typically like getting my ramen as soon as possible, I was quite disappointed as the soup was almost lukewarm when I received it. It almost felt like they had warmed up the soup expecting me to sit quicker than expected. I can understand the noodles being pre-cooked as they are shocked in an ice bath and served chilled anyways, but I would have liked the soup to be pipping hot so that it warms up my noodles once I dip them. Honestly though, this was more a disappointment that they don’t make their tsukemen to order than it being lukewarm. You’ll see a lot of chain restaurants implement the same tactic, trying to make sure customers don’t need to sit at the table longer than they need and feed as many customers as possible. In doing so they sacrifice both quality and experience and I couldn’t shake that thought when I received my meal. As a top ramen restaurant in Tokyo, I expected Fuunji to value customer experience over speed, but again it seems like they are trying to sell as many bowls as possible per night and extend their profits. The flavor of the tsukemen itself was admittedly, pretty good. The noodles are round with a bit of a wavy shape. The texture is firm and has a great chew to them, indicating they were cooked perfectly and shocked at the perfect time. Soup comes adorned with gyofun (fish powder) with slices of char siu, menma bamboo shoots, and a scoop of green onions within it. The soft boiled egg is placed on top with a couple slices of dried seaweed around the rim. Soup is nice and thick with fatty, savory notes from the chicken and incredible umami flavor from the niboshi. Gyofun helps accentuate the umami flavor once mixed in making the soup incredibly delicious. Pork char siu was nice and tender as well as having the smoky aroma from being charred around the edges. The soft boiled egg was cooked perfectly, shocked in an ice water beforehand to maintain the creamy yolk and the menma was thick and crunchy as I like them. But again, this would have been even better if my soup was served to me pipping hot. Finally, my third and last gripe with Fuunji comes in the form of a price increase and the small amount of char siu they provided in my Tokusei order. I had to do a little diving because I was unsure of what the price was before, but they did increase their Tsukemen by 50 yen according to Tabelog. In addition, in comparison to other chicken and niboshi tsukemen restaurants, I thought the amount of char siu was severely lacking for a tokusei. When I order a Tokusei Tsukemen, I expect an impactful amount of char siu ensuring I had a nice bite of meat with every mouthful of noodles. I had maybe 5 pieces of the thin cut char siu you see in the photo above. I guess it has to be a bit expected as they are located in central Shinjuku just minutes away from the station and have to offset the expensive Shinjuku rent prices some how, but as a world renown shop, I expected a bit more. Every extra topping comes at a price and you have to pay for each one if you want a nice hefty serving. Of course I could be to blame for ordering the Nami rather than the Oomori for noodles, but I left feeling pretty underwhelmed. I know Fuunji is a popular stop for tourists given its proximity to Shinjuku and most likely the closest, top tsukemen restaurant from most peoples’ accommodations, but I highly recommend making the trip toward Shin Koiwa for Menya Itto or down to Kamata for Niboshi Tsukemen Miyamoto. Both are in tiers way higher than Fuunji and definitely worth the commute. 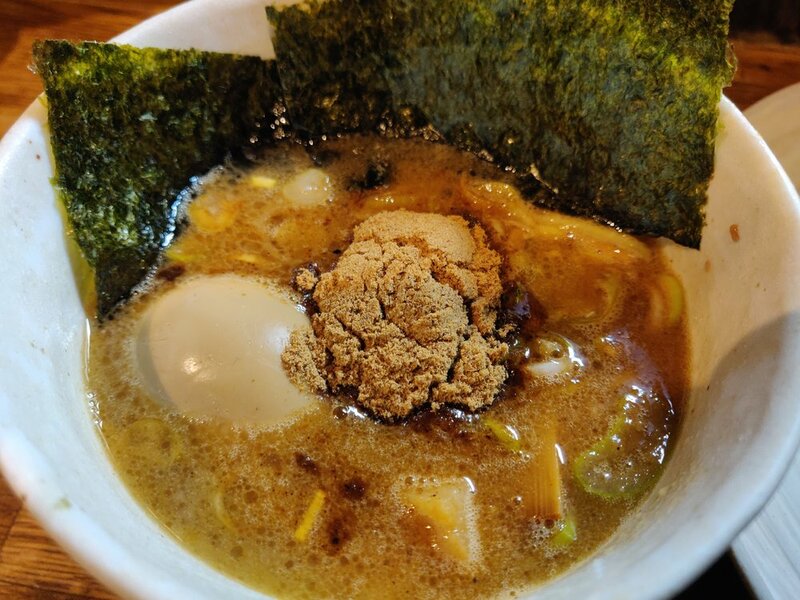 For those who still want to stay in Shinjuku, I made my way to a number of ramen restaurants in the area that I will write reviews for in the next few days so sit tight, hopefully you’ll find one that can replace Fuunji on your itinerary.